SRAM’s powerful RED-equipped ProTeams enter 2012 a potential threat to win every race, including Classics, Grand Tours, one week stage races, World Championships, as well as the upcoming London Olympics. SRAM’s componentry remains the lightest, most ergonomic, and most efficient in the world, and will begins its seventh year on the road with the introduction of an all new REDgroupset. Stay tuned to SRAM.com for details. The kick-off for the full contingent of SRAM ProTeams will be the inaugural event of the UCI calendar, the Santos Tour Down Under, where SRAM RED is the defending champion. The TDU is regarded as a favorite for riders with its incredible scenery, great course, and incredible fan base. Omega Pharma-Quick-Step Cycling Team (BEL): The Belgian super-squad will be powered by Tom Boonen (BEL), Sylvain Chavanel (FRA), Zdenek Stybar (CZE), Tony Martin (GER) and Levi Leipheimer (USA). Their goal is simple, to return to the top of the WorldTour rankings, Lefevere says SRAM components are the first step. Liquigas-Cannondale (ITA): Liquigas-Cannondale has been one of the most successful Grand Tour teams over the past several years, and will once again be lead by stars Ivan Basso (ITA) and Vincenzo Nibali (ITA) and finishing phenom Peter Sagan (SVK). AG2R La Mondiale (FRA): The French-based team managed by Vincent Lavenu is packed with versatile opportunists and continues for a fourth year on SRAM RED. They will continue to hunt for any chance to snag wins in the world’s biggest races. 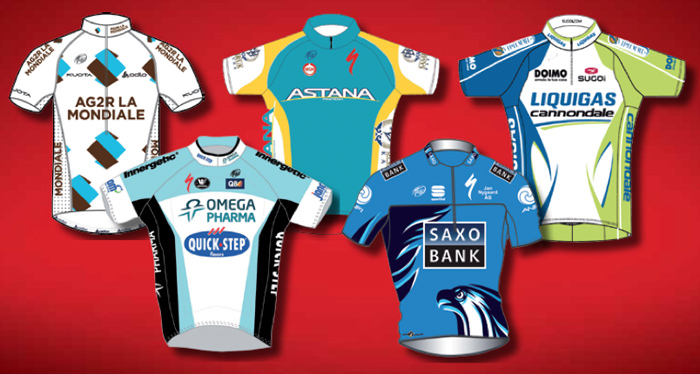 Astana Cycling Team (KAZ): Khazakstan’s talented team has a panache for big wins, and with riders Alexandre Vinokourov (KAZ), Roman Kreuzinger (CZE), Maxim Iglinsky (CZE), and rising superstar Janez Brajkovic (SLO), its certain they will have some big wins in 2012.